Recognizing the growing demand for professionals with Big data skills and increasing job opportunities for Data Analytics and Data Scientists , an U.G. programme in Information Technology have been started in the year 2018. It offers a 3 year programme for students interested in pursuing a Post Graduate programme, in MCA , M.SC(IT) , M.SC(CS) , M.B.A or to take up jobs in IT industries. Syllabus designed to meet the recent trends in current Industry. The department has qualified faculty who teach specialized areas like Java , Python Programming , Big Data Analytics , R Programming , NoSQLMongoDB , Information Security , Cloud Computing and Mobile Computing. The future of students are driven by their aspirations and not bound by their circumstances. The IT course will nurture Creativity, Lateral thinking and Problem solving skills. To train young minds into Industry ready Professionals. Producing IT professionals of global standard and to primarily fulfill requirements of the booming IT industry. Information Technology course imparts students on a wide range of IT subjects to enable them to achieve the necessary skills for pursuing a career or higher academic courses. To be a skilled big data professional. To give hands on experience in the IT industry through projects. PO 1 : To posses a sound knowledge in Data structures and Algorithms. PO 2 : Efficient programmer using high level languages and scripting Languages such as Java , Python, R-programming and UI programming. PO 3 : Developer of Open Source Technologies. PO 5 : To emerge as competent Database analyst to manage unstructured Big data. 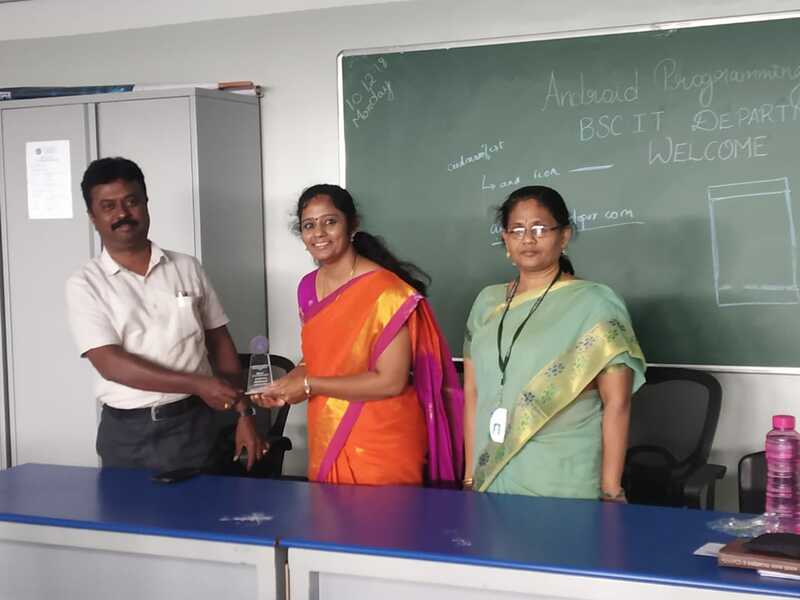 The Department of Information Technology organized an one-day Workshop on “Android Programming” with Hands-On activity. 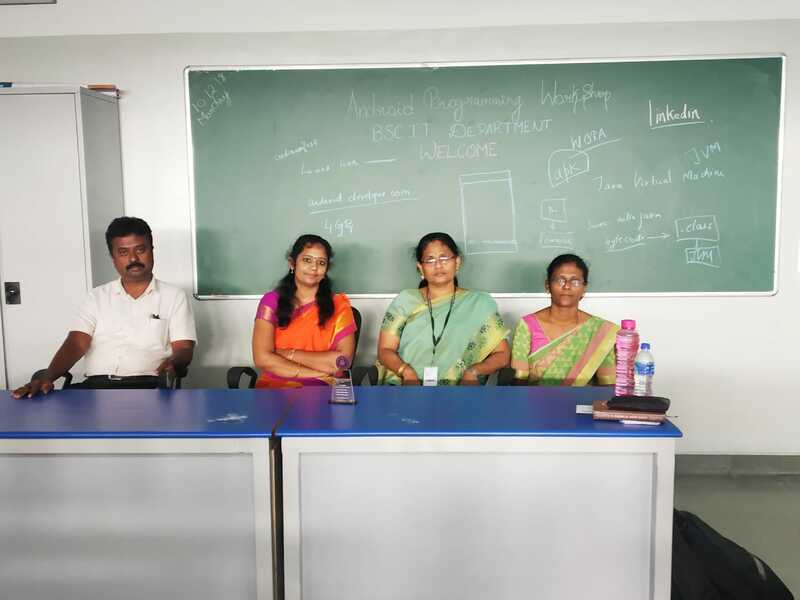 The programme started with the introduction talk by HOD Dr.J.Vanathi and was taken over by Mrs.G.ShriPradha, Freelance Consultant. The session started interestingly with an introduction about mobile applications and how they can easily be incorporated in the mobile phones. Android apps live in a highly fragmented multi-device world and it’s a process by which application software is developed for hand-held devices. The Resource person covered the aspects of Android Basics and Layouts. The first year IT Students started building apps by selecting components and specifying their behavior. The students were given hands on training to create their App by using android studio software. The session made to acquire competency to develop, test and launch mobile app quickly on mobility platforms such as Android and Windows. All students participated enthusiastically and learnt the APP development. The workshop ended up by the thanking note given by Mr.S.Dhiswanth, Association Secretary, B.Sc (IT) department. The Department ofB.Sc(IT) inaugurated the Information Technology Association G-ITHUB.The main objective of this inauguration is to “Think More, Think Differently and Think Radically”. TheDeputy Director Dr.P.V.Kumaraguru welcomed the gathering. 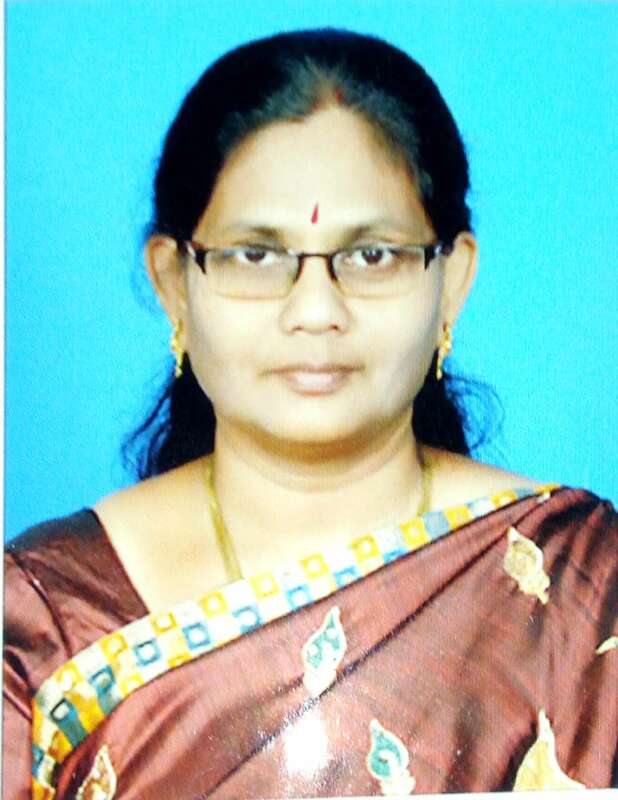 The Head of the Department Dr.J.Vanathi introduced the chief guest .The function was inaugurated by the resource person Mr. K. Vipinendran, Associate Professor, Department of Printing and Technology, College of Engineering, Guindy, Anna University. His workshop explored many interesting insights towards “Lateral Thinking and Creativity”. He made the students to think “Out-of-the-box” concept. All students participated enthusiastically and gave creative answers for the exercises he conducted. He insisted that lateral thinking and creativity can be developed by Knowledge Collection, Idea Generation, Sleep Over time, Eureka or Aha moments, Analysis and Implementation. Among which “Focus” is the most important mind-setwhich instinct thecreative thinking that can be developed on regular practice. Finally, he emphasized the concept of“Idea Bank” for the students to deposit their innovative and creative ideas once in a month to widen theircreativity. These ideas can also be analyzed and implemented for progressing of the college. The inaugural function ended up by the thanking note given by Mr.S.Dhiswanth ,Association Secretary, B.Sc(IT) department.